This is one of my favorite weekends of the year. After graduating college during Texas’ last major economic crisis in the mid-1980s, I did my best Magnum P.I. impersonation and escaped to Hawaii to work in the hospitality industry. After four years of surfing, scuba diving, and living the laid back life, I moved home to Texas with an island girl that was in for a bit of a culture shock. My soon-to-be wife quickly realized that Texas and Hawaii are a little different so we started looking for a way to bring some of the culture of the islands to the Lone Star State. In 2002, we moved to the Hill Country and started the annual “Aloha Summer” Luau in our backyard. We hoped to make new friends in our new home by sharing the special spirit of aloha. My favorite part of the luau is cooking the kalua pig in my prized imu, which is just beyond the edge of the yard. The whole hog is wrapped in banana leaves, stuffed with hot lava rocks, and smoked and steamed underground for sixteen hours. Richele rounds out the rest of the menu with island recipes and specialty items shipped from Hawaii by family members. There has always been a costume contest, games for kids, and tropical concoctions (some more potent than others). I am always happy to eat the leftover poi. Three years ago, we had a couple of hundred people in the backyard when it started pouring down rain. After cleaning up hundreds of footprints from drenched partygoers seeking shelter in the house, Richele subtly suggested that we find another venue. The following year we turned the luau into a composite community fundraiser. The idea was simple. Put on a traditional Hawaiian luau and invite non-profit community organizations that are doing good work for local families to participate and tell their stories. This way, they have a large crowd and a fun environment to build support, raise awareness for their cause and make new friends. In 2010, we were able to donate $5,000 to participating organizations and increased that amount last year to over $9,000. Every organization receives a donation and in return, they are asked to provide an activity for kids and to invite all of their supporters to show up for the event. This year’s luau is poised to be bigger and better than ever. When I moved to Hawaii at the young age of 21, I didn’t know a soul, but the “aloha spirit” of the people made me feel welcomed and at home. 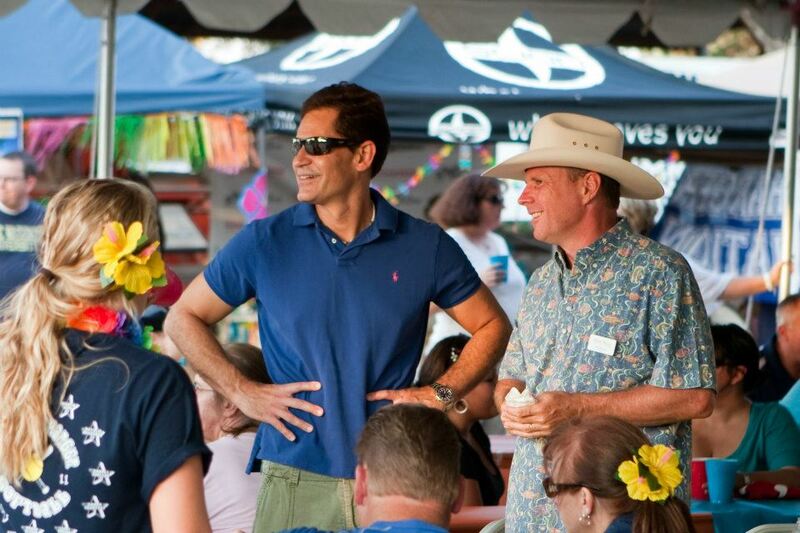 The “Aloha Summer” Luau aims to recreate the same openness, warmth, friendliness and sense of belonging that was shown to me years ago while we shine a light on the great organizations that work hard all year to bring that same spirit of aloha to our wonderful little community of Boerne.